Our super-sized Christmas edition is here! 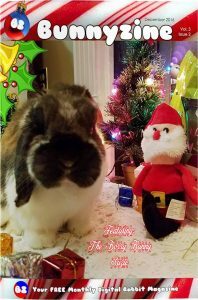 We have a gift suggestion guide, a book review, an update on Mrs. Obi, and a SUPER HUGE pictorial of bunnies celebrating the holidays (thank you SO much for the submissions) and more! Fair warning to mobile users, this issue is 25 Mb (twice the size as usual). I hope you enjoy this issue and please share. We are at an average of 200 readers and our goal is to reach 5000. Since Penny is our main focus for this issue, we begin with her rabbits: Russette, Lance, and Sammy, being this issue’s featured bunnies! 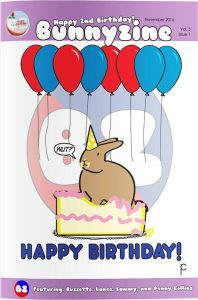 Plus the issue is jam-packed full of Penny’s art, Penny’s comic series Regarding The Secret Life Of Rabbits, which has also recently celebrated its two year milestone, and Penny’s shops where you can see a selection of items that Penny sells. We also have a new case for Ears O’Fluffin to solve. Welcome to our Penny-centric issue where we love all things Penny.